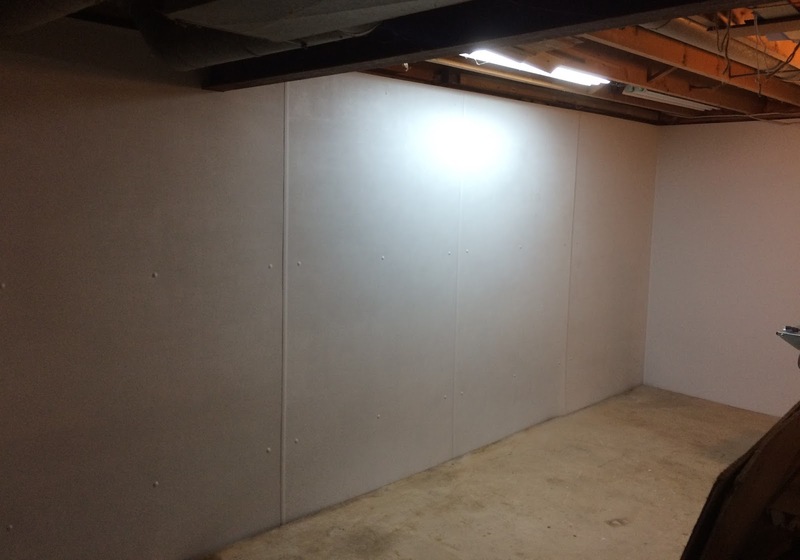 I think I mentioned previously that one of the things I've had to do over the last two months is prepare my garage and basement workshop for some foundation work. Well, I finished the preparation and the masons did their part this week and it looks very nice. I'm quite happy with the job they did. However, part of the deal was that I would replace the steps going into the house. 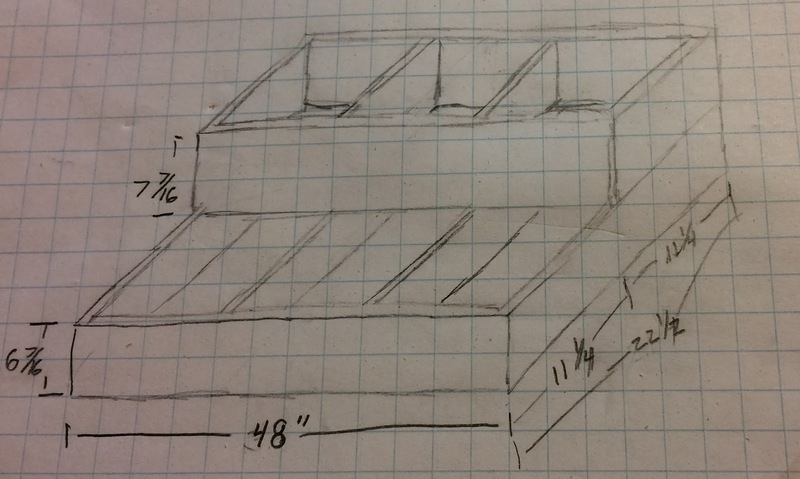 No big deal, I just need some 2x8's and some deck boards and a little bit of planning. My plans do not 100% represent the actual build. My stairs are 4' wide and when using 5/4 deck boards it's recommended to have joists at least every 16". My final build actually has five not four... uh, stringers? I'm actually not sure if that's what they're called for this kind of stairs. Essentially there is a large box on the bottom that is 6-7/16" high with a top box that is 7-7/16" high. Each step is actually about 10" deep not 11-1/4". My sketched plans for these kinds of projects are usually just for rough materials estimates and to work through my mental build plans. Shortening the steps from 11-1/4" to 10" doesn't really change anything important. So how did I come up with my measurements? Aren't there a lot of rules and stuff with building steps? Well yes, there are rules and codes and such. I sort of know the rules... You want your steps to be around 10" deep and between something like 6" and 8" high and they should all be consistent. However, I don't need to know them exactly. Instead I cheated. I just looked up a deck stair calculator on the internet, punched in the height of my door sill and used the results. This picture helps explain why the bottom box is an inch shorter than the second step. 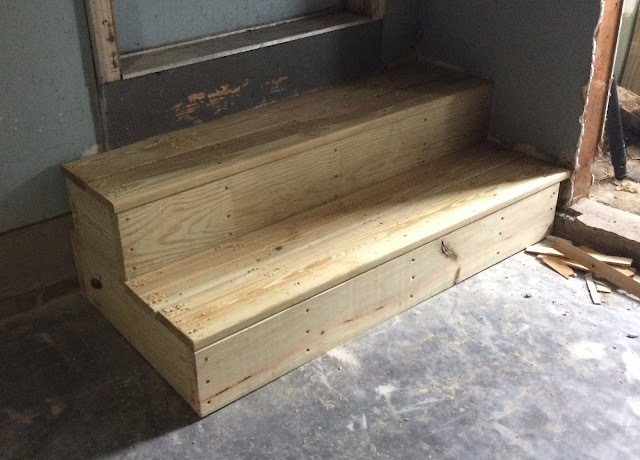 Each step is a total of 7-7/16" high. The first Step is 6-7/16" high plus 1" from the deck board. Since the second step isn't build on top of the deck boards it needs that extra inch to make up the height from the first steps deck boards. Conveniently 7-7/16" is pretty much the height of a 2x8 stood on edge so I just needed a bunch of 2x8s. Inconveniently, I don't have my truck anymore. I've got multiple friends with trucks who are happy to help me get stuff home from the lumber yard but I prefer saving favors for when I really need them. Instead, I decided to buy a cordless Makita 18v LXT circular saw. I'd first gotten a hankering for one of these walking though my local DIY store. For the last few months they have them on an end cap selling for $100. I occasionally have the need to do woodworking where there isn't a convenient power outlet so I thought for $100 it might be worth it. Then I did my research and found the brushless version which has been very well reviewed. Sure, it's almost twice as much but I already have the batteries I got with my Makita drill/driver combo. So I ordered one. Well, it didn't work out quite as cheap as I was hoping. Turns out the saw will not run on the 2 Ah batteries I have for my drills so I had to order some 3 Ah batteries. I may not be able to use the smaller batteries with the saw but I can use the bigger batteries with my drill/drivers. So word to the wise, the saw works with 3 AH BL1830 batteries but not the 2 Ah BL1820. In any case, Saturday morning saw me in the parking lot at my local lumber store cutting 2x8-10 down into lengths that would fit in the back of my SUV. This was my first actual use of my new saw and I've got to say, on first look it is very nice. I've got a very nice corded Milwaukee circular saw but it's a bit heavier and it does require a power outlet. The Makita was more than capable of cutting through the pressure treated 2x8s like they were butter. The rest of the morning had me in my garage building the steps. My 3Ah battery was just enough to break down the boards in the parking lot and to then make my finish cuts once I got home. It ran down early into my second project of the day. In my limited experience, the 3 Ah is plenty if you're just going to be doing small projects or for occasional use (like breaking down plywood before taking it to your table saw) but it wouldn't last very long for larger projects. Since the batteries do charge really quick you might be able to get away with two3 Ah batteries on a larger project but you might also want to invest in the larger 4 Ah or 5 Ah batteries if you plan to use the saw a lot. Why no in-progress photos? Well, there are a couple of reasons. Mostly it's just that I needed to get the steps done and didn't want to take the extra time. Also, I don't think there's much interesting in the project. It's only two boxes stacked on each other with some deck boards on top. It's done, I can get in and out of my garage and in a few more days I can start parking my cars in the garage again.